Versace has launched its new Fall Winter 2018 campaign, which features the longest-ever advertising image. Shot by Steven Meisel, the never-before-seen image shows fifty four models symbolizing inclusivity and diversity, key values for Donatella Versace and her vision for the brand. 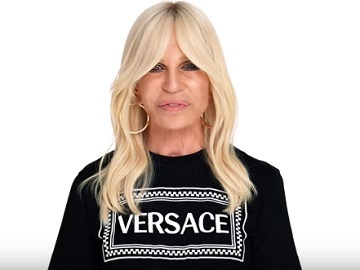 Donatella also stars, together with some of these models, who are part of her team, in a short ad explaining the correct way to pronounce the label’s name. “It’s Versace, not Versachee”, she says on the commercial. The campaign is also aimed at delivering the following message. “We are the Versace family. We live the Versace way. Joined by a link that goes beyond DNA. A family who supports the same values together”. The FW18 collection for women includes an athletic soccer style T-shirt featuring the Versace vintage logo and Barocco Blasone on a contrast color crew neck, short sleeve jersey, a pleated mini skirt crafted in silk, featuring the Harlequin print inspired by the elegant Versace casa in Via Gesù, form-fitting, high waisted leggings also featuring a very Versace bold Harlequin print and Barocco details, a chevron-embellished cardigan with bold color, loose sleeves and crew neck, sneakers featuring the Harlequin Print and the Versace logo on tongue of an athletic staple, a yellow sporty dress, with long-sleeves, turtle neck and the Versace Vintage Logo from the 1980s, a classic trench coat in blue, with a sporty Versace twist featuring Vintage Logomania print lining, double breasted metal button closure and waist belt, a short puffer jacket in the Signature Pillow Talk print, featuring an off centre Medusa button closure and a fold-over collar, and more. Various bags, such as tote bags and cross body bags, included in the collection, also feature the Vintage Logo print. The collection for men includes the Versace team uniform, as well. The fan spirit inspired by soccer jerseys is featured on a crew neck T-shirt featuring the Versace Blasone coat of arms in the front and Via Gesù 12 – the Versace Milanese Palazzo address on reverse. Wool dress pants, a single breasted evening blazer, a denim jacket featuring a Blasone Barocco embroidery, breast and lateral pockets, and button-up front closure, a Blasone Barocco embroidered sweatshirt featuring long sleeves and a classic crew-neck, an eclectic and bold silk shirt, featuring the Medusa Pop Foulard Print, which reintroduces iconic Versace details in a fun and fresh way, sneakers, Mock Cros Medusa Chain Loafers are among the pieces included in the men’s collection, alongside a series of accessories.